I am sorry for not posting yesterday and that is why I am going to write about yesterday in todays post. I will also talk about what I am going to be doing today. Yesterday was our last day in the villa so we made the most of it and just chilled out and got in and out of the pool. I had really enjoyed our time there and I am greatful for the favt that I could stay in something as grand as that. I loved every minute of being in that villa it was amazing. At about one o’clock our taxi arrived and it was time to leave the beautiful villa I got my bags and said good bye to the beautiful place. Apparently we were the first people to stay there and the owners had moved back to Germany and started to rent the villa out. I was a bit sad when I got in the taxi because of the gould times I had there. The taxi was taking us to Ubud which is one of the most popular tourist places in Bali but we were staying in the traditional area which had no tourists it was called Mas, Ubud. The taxi ride was one hour and we got lost at one point but then we found the houses. It is a really nice area and I am glad we booked this place. Behines our little room is a rice field which you can walk down to and when you reach the bottom you can see a beautiful river. There are seven people staying with us including me and my mum and they are in seperate rooms but we all have to share one. The family that own the houses are really nice and have a son called Agus and me and him have made friends so I am happy about that. Once we had got into our rooms we all came outside and started chatting to the family that own the houses (that was when I met Agus) they are really nuce and caring. After that we all started to walk down the road because tomorrow we are going to a ceremony and we have to wear special clothes. We found a nice place to get a drink so we got one I had a Mocktail and also some fries and a banana split; many people had deserts and they were all really good. We continued to walk and we found a nice place which had exactly what they needed so they looked in their but then they saw another nice shop down the road so they went to that. In the next shop they all tried on a few things but some of them did like any of the stuff. They waited to go back to the other shop. Only one of the girls really liked the things so they all went back to the other shop; they liked the stuff there sonthey got the stuff from their. Then the ither girl liked the thing in the other shop better so she went to get that. Further down the road we saw a really nice looking restaurant were we could get some food. We finally walked to the restaurant and we got a big table; we were all given a cool towel to cool us down and a nice drink. Then they asked us “what do you want to drink?” and I wanted a Ginger Soda so that is what I asked for. Then she asked “what do you want for some food?” so I said “Tempe Goreng please.” Tempe Goreng is tofu and rice cake with peanut butter sauce it was good. So today we were told that we were going to a religous festival a temple and it is the first underworld festival in 30 years I felt really privaliged. The man that was taking us was the man that owned our little rooms and he was a soldier dancer and he danced during the festival. We were also going to be accompanied by a german man called Yanis who was staying at our place. 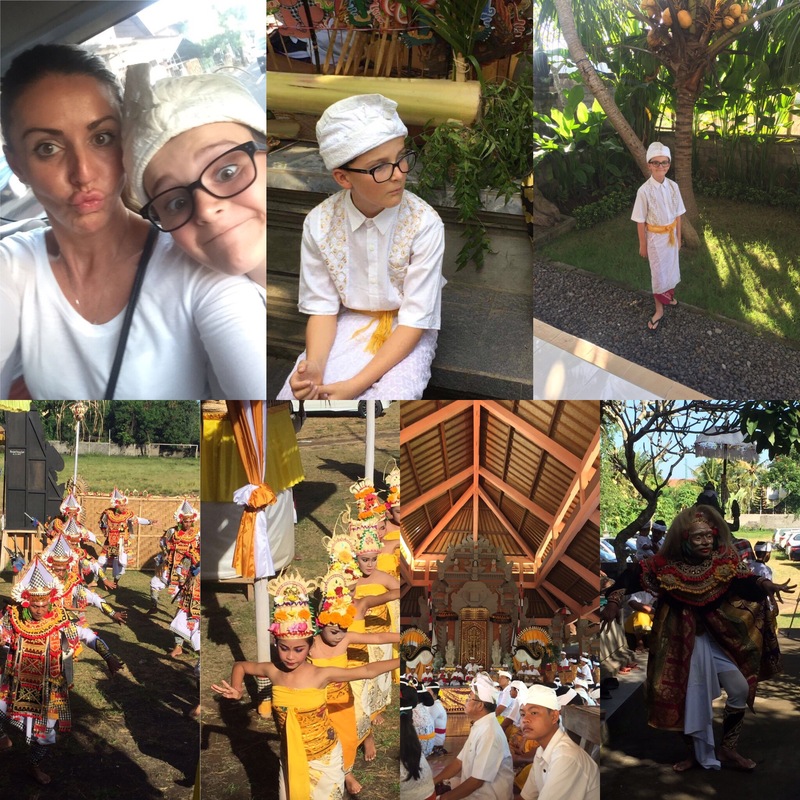 We had to wear ceremonial clothes; you had to wear a white or yellow top and then a sorong. I think I looked amazing and so did everybody else; once we were ready the man said “Get in the car I will drive you there.” I thougt that was really kind of him. We finally arrived at the festival and the owner if our huts went off so he could get ready for his dance. Yanis the german guy said he will take us around. He got out of the car and started explaining the colours of the bamboo he said that the different colours represent different directions. He explained how there are different sections of the festival there is the inside were they offer their stuff to the gods and there is an outside bit where the dancing is. We first went to the outside bit because the original balinese instrument called the gamelan was being plade and it sounded beautiful. 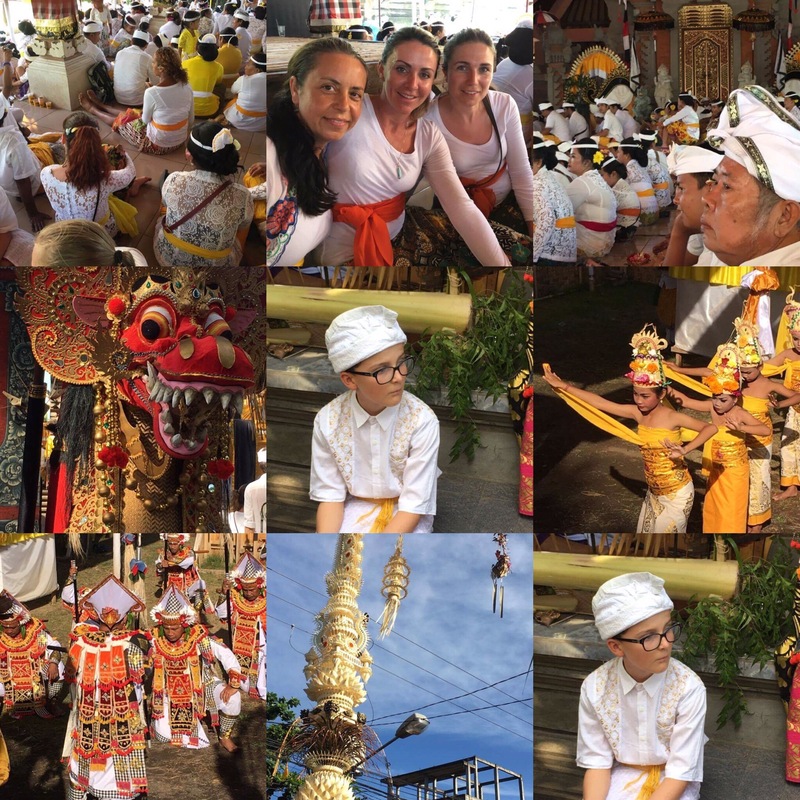 Yanis started saying how the balinese music is completley different to western music because it is made to sound out of tune and the different sounds are ment to interlock. So we sat and watched the men play the instruments. I was mezmarised by how the instrument worked and how it sounded. Our friend Ayuda was going to dance in a minute so we went to go and watch him. He looked amazing he was all sparkely and had a beautiful hed piece on. He started to dance and he was very thourough and his hand movements were amazing. He kept dancing for about 5 minutes and it was amazing. Yanis said that they dance to scare off the evil spirits. Next some girls came out that had a hat on and started dancing. Yanis said that they were offerings to the gods and they were offered because they were virgins and were also pre-mestuaration. There dancing was beautiful and they all had lots of make-up on. 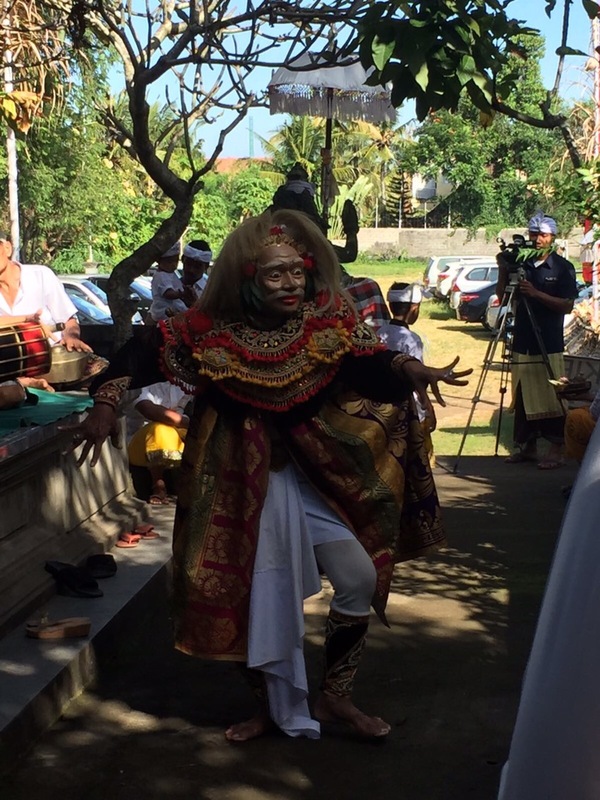 We went back to the music area and there were now men with masks on and they were dancing to the gamelan. They kept swapping with each other and finally there was a man and he was about 90 and he was very good at dancing whith the mask on even though he was old. Ayuda’s dad carved the masks out of wood and them painted them. There was also a man that was doing a pupet show with the gods. Apperantley he told the stories of all the different gods in the sacred language of javanese. It is said that the man channels the gods and sais what the gods want to say. The outside of the festival is very full on. We were ready to go inside to see the actual temple now so we made our way. Yanis started to explain how there are two parts of the inside. 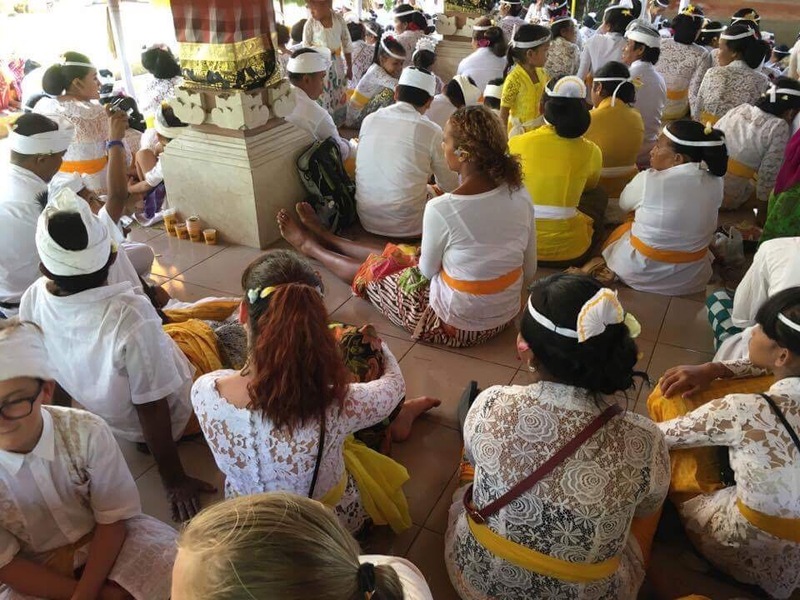 There is the place where the priests are and the other balinese people and there is the place just outside where the priests are. We made our way to the gate but we were then stopped by a security gaurd and we were told that we werent aloud inside. We kept trying but we kept getting told off. So we recognised our defeat. So we went to go and get a drink after we had our drink we decided to try and get in through the back door. So we headed to the back entrance. We got to the back alley and tried to get were the priests were but we got kicked out. Then we founded the bit outside the priests area and the security guared said we were aloud in their so we finally got in. We sat down and watched the parades come through it was amazing. It felt like I was the only white kid in the whole of the world. No one seemed to except us. Soon the room started to fill up with people and people started to go up to where to musical instruments were. A couple minutes later the music started it was a gamelan and some drums it sounded fandabedosey. People started walking down the paths in the middle and entering the priests room. The music was inviting the gods in and it was almost as if the gods were playing the music through the people. A bit later we saw a pig that was being carried and Yanis said that the pig was going to be killed and offered to the gods. There were ladies being carried on chairs being carried. The whole thing was mind-blowing even at christmas we dont celebrate as much as they do everyday. After us being in the room for a while we were starting to be accepted and there was an old man which was very kind to us. There was free coffee at the celebration and it was very good. I was very happy that we went to the festival. Finally we got to the bit where they prayed they lit incesnse and had flowers we didn’t have any of that so the old man next to us gave us some flowers and incense. All of the temple went quite and a man started speaking in balinese and I guess he was explaining what to do. We do not believe in hindu gods so we just prayed to god. People were offering their flowers to the gods it was really a great experience. Once everyone had finished praying we felt hungry so we asked Yanis if he could take us for some food. On the way out we met Ayuda’s grandad and he said Ayuda was now dancing to the priest. We found a place that did fresh gado gado which is a balinese food that is really good. We all had it and she put peanut sauce and tofu on it. Once we hot our food we went to get a Pocari Sweat which is a drink that replaces your salts that you loose in your sweat. We went to find a place to sit down and eat our food; we found a place in the shade down the road. The food was amazing put a bit spicey. Everyone enjoyed it. After we finished our food Yanis told us that Ayuda was wating in his car so we went to walk to the car. We finally got in the car and it was like a oven. Yanis went off with Ayuda’s grandfarther to get some clothes. We all eventually got into the car and we drove home. When we got home the first thing I did was get changed into shorts and t-shirt. Agus my friend came over and asked “Do you want to come over to my friends house?” I said “Yes I would love to!” So we set off. We arrived at his mates house and he was called Cricotar his house was very deprived all they had was a couple matresses on the floor. We didn’t stay there for long and we went back to our house but my mum wasn’t their so I knew that she was at the cafè. Once I got here my mates left and that is where I am now writing this post. Today I have had a experience that I may never get again and I am so greatfull for what I had today. It was such a great experience I was mezmorised by what happened today. I hoped you enjoyed hearing about it .